Have you ever heard of “shirataki”? You may not be familiar with it, but shirataki is a very common food in Japan. It’s a type of “konyaku / konjac” cut into noodle-like strips. But what is konnyaku (?_?). Konnyaku is a Japanese traditional health food with a firm jelly-like texture, made from yams. And the other day, I noticed an article saying this shirataki is becoming very popular, even in America. 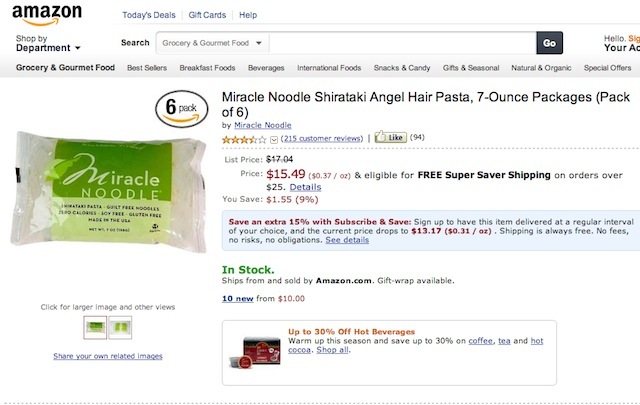 According to the article, on the American Amazon shopping site, Shirataki Angel Hair Pasta (What!? Pasta??) produced by a food maker Miracle Noodle is ranked at #17 in the food category (data of Feb.10). This product has over 200 reviews. Miracle Noodle produces wide and flat versions like fettuccine pasta. The main reason why shirataki is so popular in America is because it is healthy, and good a part of a slimming diet. Here are some voices of praise from reviewers; “A diet life saver!”, “No guilt noodle? This definitely is a miracle!”, “Healthiest noodles you can buy”, and so on. Around 100 reviews out of the 200 are rated ‘five stars’. For us Japanese, shirataki is perfect for sukiyaki, but American people seem to have it with pasta sauce. It sounds kind of innovative to us LOL.